The Picturing Success podcast is an extension of a friendship and conversations about photography. Rick Sammon & Larry Becker have been friends for years and since they’ve both been in the photography world, teaching and presenting along side the best photographers in the world, they have friends and industry connections that make for an amazing guest list on their show. The personal and professional lives of Larry & Rick revolve around professional photography, and coaching others along the way. Rick’s latest books are Creative Visualization for Photographers and Evolution of an Image. All totaled, Rick has written 37 books. Rick also has 17 classes on KelbyOne. Visit with Rick at www.ricksammon.com. Rick can be contacted at ricksammon@me.com. Larry’s first small business after college was an ad agency where Larry did everything from photography to layout and design. As an early adopter of desktop publishing, and Photoshop, Larry found there was a huge demand for training. He sold his ad agency and delivered training seminars across the country, as well as teaching Photoshop at the University of South Florida. 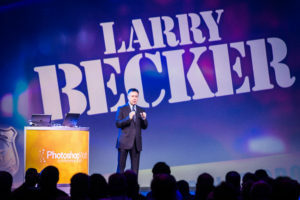 Larry’s Photoshop and photography skills turned out to be a perfect match for the National Association of Photoshop Professionals (NAPP), where he accepted the position of Executive Director for 5 years. In the following 5 years, Larry stepped up his camera equipment expertise and served as the on-camera reviewer of DSLR camera gear for B&H Photo in NY, while also managing a team of nearly a dozen talented video production experts in a multi-million dollar video studio. These days Larry has 2 equally divided career paths. 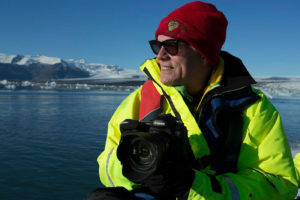 He serves as an on-camera trainer for Canon USA, and KelbyOne, as well as the host for Photoshop World, and on-camera host for The National Association of Broadcasters (NAB). The other half of his career is helping still photographers add simple video production to their still shooting business, to boost their income considerably, as well as improving their client value.